The main reason Alamo has been so successful over the years is because of our outstanding coaching staff. Our coaches are local high school, middle school, and college coaches, and elite college players. Background: Rachel played two years of collegiate volleyball at Southwestern University. She then transferred and graduated from University of Texas at San Antonio with a BS in Kinesiology and a Minor in Math. She is currently teaching math at Judson High School where she is also the Varsity Volleyball and junior varsity Soccer coach. Rachel grew up around several aspects of sports, BMX, soccer, and volleyball, and was very fortunate to be a part of the Junior Olympic Program for cycling. She had the opportunity to be a resident at the OTC in San Diego where she learned from some of the best exercise scientists, nutritionists, and coaches in the world. Background: Born and raised in San Antonio, Monica played volleyball at the University of the Incarnate Word. She received her BA in Education in May of 2001 and a Masters of Education in December 2002 from Incarnate Word. 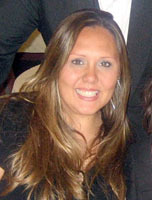 Monica was the head volleyball coach at Fox Tech High School for 2 years. After leaving Fox Tech she then moved to Reagan High School from 2005-2014, where she coaching junior varsity volleyball and junior varsity softball, as well as teaching Geometry. In 2014, Monica took the Head Volleyball Coaching position at Brennan HS. She was Brennan for three season and has recently accepted the Assistant Athletic Coordinator and Head Volleyball Coach at Harlan High School. In 2011, Monica lead her 17 Kaepa team to a 3rd place finish at USAV JO's in the American division. Background: Stephanie holds 22 years of successful high school volleyball coaching knowledge, as well as experience as a coach for basketball, track & field, golf, soccer, and softball. 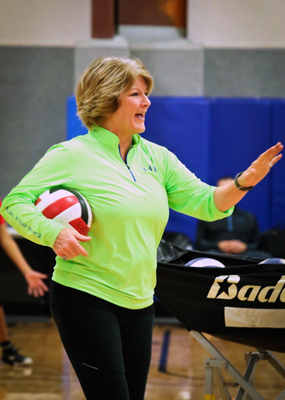 She has coached many Alamo teams to success, including USAV Girls Junior National Championship bids and a 2014 Patriot Division Championship team. Stephanie is currently the Head Volleyball Coach at Hays High School; a Special Education Teacher, and Homebound Teacher. She has been married 24 years to John L Coates and they have three children Tyler (23), Mackenzie (19) and Rylie (8). In her free time she enjoys hunting, fishing, boating, and ranching. Background: After playing five years for Alamo during her youth career Melissa is excited to be back on the sidelines for Alamo as a coach for the 2018 season. As a high school player, Melissa was named Defensive MVP as well as first team All-District in her junior and senior. She continued her playing career into college where she competed at St. Mary’s University. 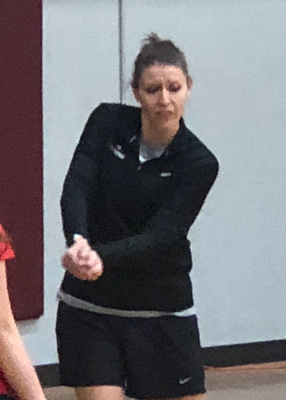 In addition to her playing career, Melissa has gained experience coaching as a JV volleyball coach, freshman volleyball coach, freshman track coach and freshman basketball coach. Melissa loves coaching at the same high school graduated from and enjoys her dog Brody. Background: Although new to Alamo Shannon brings years of elite playing and coaching experience. After a successful playing career at the University of Arizona, she went on to play professional volleyball for 15 years, spending 10 of those years playing on the Puerto Rican National Team. She is currently the League Director at SOA. Shannon is married with an 8-year-old daughter, Nevaeh. Background: Phil made his way to San Antonio 15 years ago from San Diego, CA. While in San Diego Phil played Division I Men’s Volleyball at San Diego State University. In 2 of his 4 years his team finished 3rd and 5th in the Nation. He graduated from SDSU in 1995 with a degree in Social Science and emphasis on Economics. After SDSU Phil had an extensive tryout with the USA National team trying to make the 1996 final roster for the Atlanta games. He competed for several years on the beach with the AVP before moving to San Antonio. From 1998-2003, Phil was the Assistant and then Head Coach at Texas Lutheran University, followed by 1st Assistant Coach at UTSA. In 2003, Phil found and directed Extec Volleyball, qualifying 9 teams for Junior Olympics. Since his arrival in San Antonio Phil has coached and directed dozens of standout players that have earned awards from All-District to All-American honors, many who have gone onto college by earning athletic scholarships. Phil has earned many awards as a player and a coach. He has trained the most elite athletes in the San Antonio Area for 13 years. However his greatest achievement is his wonderful family. Phil is married to his beautiful wife Nicole. Their son Blake was born on March 24th, 2010 and they are expecting their 2nd child (a baby girl) December 7th, 2011. Background: Ho brings 8 years of college coaching to Alamo, most recently from Armstrong State where he served as an assistant coach. Currently Ho is a Psychology Professor at Texas A&M- San Antonio and Volunteer Assistant at Our Lady of the Lakes University. Voted as Most Inspirational Player - Doolen Middle School (8th Grade), Ho is married to his wife Amanda. The couple has two dogs, Bruno & Stanley. Background: Graduated from East Central HS (basketball) and University of Texas at San Antonio (volleyball) with a BS in Education. 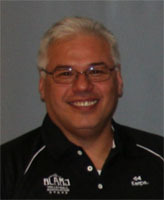 Coach Correa was the head volleyball coach of Incarnate Word HS from 2001-2003 where he won a state championship in 2001. Coach Correa is currently an assistant volleyball coach at Reagan HS and also coached football, basketball, and softball. In 2005, lead his 16 National Team to a 10th place finish at Junior Olympics. Coach Correa is currently an active player in USAV in men’s and the coed circuit. His two daughters currently play for Alamo 15 Kaepa and 12 Kaepa Premier teams. - Head Coach of the 1998 (18 Under) AAU National Champions for Metro Volleyball. And has Qualified over 10 other different times for USA Junior Nationals. Coach Bernal has a BS in Kinesiology from Texas A&M University-San Antonio with a Minor in Health Studies. He is a Full time Private Training Coach of & Team Coach for Alamo; and a USANA Health Science Distributor. "Faith is to believe what you can not see; the Reward of that faith is to See what you believe"
Coaching at Alamo Since: Coached with Alamo in the 90's, then with other clubs her in SA and in New Braunfels until 2012. Background: Marcia grew up in Minnesota, moved to Texas as a Junior in High School playing at Madison. Marcia began playing college ball at TLU and after changing majors transferred to Texas State, then SWT! She loved playing for Karen Chisum and the Bobcats throughout the rest of the college. She earned All-Conference Academic honors and the Jean Smith Award(Outstanding Senior Female Athlete) her Senior year. After graduating Marcia was an assistant coach at Churchill HS and Madison HS before getting the Head position at MacArthur HS from 90 thru 2000. She has since moved on to the private sector where she owns a pavement maintenance business and continues to coach thru club volleyball. Background: Coach Kelly is from Helotes, Texas and is a graduate of Sandra Day O'Connor High School. After high school, she went on to Austin College where she was a 4 year starter and 2 year captain for the Kangaroo volleyball team. In 2013 she received her Bachelor of Arts in Communication and in 2014 she received her Master of Arts in Teaching both from Austin College. She is currently in her third year of teaching at Madison High School as a JV volleyball coach, freshman basketball coach and US History teacher. This is her 4th year as a head coach with Alamo Volleyball. Background: Michael earned his bachelors degree in business from St. Mary's University and has coached volleyball at all different skill levels. He has been a part of various volleyball clubs as both a coach and club director across Texas and has been part of coaching staffs having won multiple state titles and a national title. Background: Lindsay is alumni from Alamo Volleyball and she received a full scholarship to play volleyball in University. She started coaching club in Lubbock, Texas and when graduated from Texas Tech, she came back to work for Alamo. Lindsay has also coached over seas in Australia and has recently returned back to the states to start another season with 15P. Background: Attended Medina Valley High School and Texas Lutheran College. Began coaching at St. Paul Catholic School in 1978, forming the first ever girls school Basketball Team in November of that year. The following year, Coach Debbie(as she is referred to) formed the first volleyball team and from that point served as the girl's athletic coordinator until her retirement in 2012. During her tenure as a Volleyball Coach her teams captured 18 Archdiocesan Volleyball Championships with four coming from 1992-1995 and five coming from 2002-2006. In addition, Coach Debbie was responsible for expanding the Girls athletic program to include Cross-country, Track & Field and Softball. In 2013, her 13Premier team captured the Bronze in the Open Division of the Girls Junior National Championships, and in 2016 her 13Premier team earned the Gold in National Division of the Girls Junior Nationals. Background: AD has been a head and assistant coach to many national teams for over 15 years. In 2011, she assisted Alamo 18K to a 2nd place finish at Nationals. In 2016, she assisted Alamo 13P to a 1st place finish at Nationals. From 2007-2012, she helped lead Incarnate Word High School to five final four appearances and two state final appearances in TAPPS. She is currently the assistant coach at Providence High School where they have had 6 consecutive playoff appearances in TAPPS since her return to the program in 2012. She earned a Bachelor's degree in Business with a minor in Finance from UTSA in 2004 and is currently the Sales Support Manager at Spectrum Reach. Background: Caitlyn was a strong prep-athlete earning Academic All-District Honors, and Female Athlete of the Year for Lee High School. She was also named to the American Volleyball Association National Honor Roll while at the University of Incarnate Word. Caitlyn has a masters in Literature from Oklahoma State and is working on an MSB from UTSA. Caitlyn is married to an awesome “soon to be CPA.” They have two pets, Chuey and Mr. Fritz. Background: Dani played four years as libero for New Braunfels High School, where she helped lead her team to the state championship game her senior year. In her senior year, she earned top awards of Prep Volleyball HS All American 2012 and 2012 LonestarVolleyball.com Libero of the Year. She also played club volleyball with Alamo for three years. Dani went on to play college volleyball for UTSA from 2013 - 2016. At UTSA, she was apart of winning two Conference C-USA championships and a trip to the NCAA tournament. Currently, she is a senior finishing her undergrad degree in Exercise Science while also minoring in History. Dani has been coaching volleyball since her freshman year in college and plans on using her experiences from coaching and being a former player to help younger athletes be successful. Background: Meg a four-year starter at middle blocker for the Tarleton State University is proud to be back working for Alamo after playing for the club from 2010-2012. While at TSU, Meg was named Academic All-Conference, LSC Commissioners Honor Roll and 2nd Team All-Conference. The Texans were also successful becoming the Lone Star Conference Tournament Champions, and Lone Star Conference Regular Season Champions. After serving as a Graduate Assistant at TSU, Meg is currently an Anatomy and Physiology and Medical Micro teacher at Reagan HS. She is recently married and enjoys trying new food, going to the coast, being outdoors and going fishing with her new husband Mitch. Background: Currently Girls Head Coach/Athletic Coordinator at Hector Garcia M.S. since school opened in 2009. Served in same position at Rawlinson M.S. from 2005-2009. Has coached volleyball with N.I.S.D. for 21 years. Entering 14th year coaching Junior Volleyball, ages 12-15. Educational background includes B.S. in Sports Management; B.S. in Business Administration; M.A. in Elementary Education. Background: Anna played volleyball for 11 years with 3 years under Coach Debbie Gonzalez at St. Paul's Catholic School and 4 years under Coach Keith Wilson at Providence High School. Anna continues to play for various sand leagues throughout the city. Anna played club for 7 years with Home Court America, Mission City, SA Heat, Top Gun, and Texas Juniors. In 2012 and 2013, Head Coach at St Paul's School, coaching both 'A' and 'B' teams culminating in the 'A' team winning the District Championship. 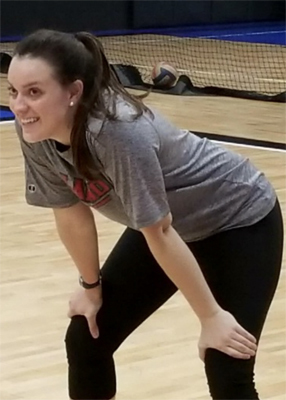 Anna's club volleyball coaching experience has been with the Texas Aces club as a head coach for the 14U division and joined the Alamo club family in 2013 as a head coach for the 12U division. Background: Sarah, a graduate of Trinity University played four years for the Tigers garnering Two Sweet Sixteen finishes at the NCAA Division III level. While in college she also spent time giving private lesson. Now, she works for Spurs Sports & Entertainment. Originally from Houston, Sarah spent some time in Arkansas as a child and is a HUGE Razorback fan! Background: Stacey graduated from O.W. Holmes high school where she played under Mike Carter as a setter. She was an All-City, All-District volleyball and softball player, winning numerous MVP awards. She played college softball on scholarship at University of the Incarnate Word where she completed her Bachelors of Interdisciplinary Studies specializing in EC-4. She received her masters in Principal and Administration from Concordia University. Stacey served as head coach of volleyball and softball at St. Peters middle school and St. Luke’s Middle School, winning district and city champs multiple years in a row. She currently teaches 4th grade at McAndrew Elementary. Stacey played for Texas Juniors & Alamo during her middle and high school years. In 2011, Stacey lead her 13 Kaepa team to a 3rd place finish at the AAU Junior National Championship. 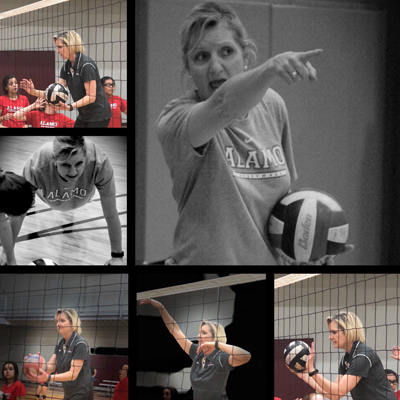 Stacey was currently named the NIKE coordinator/representative for volleyball in San Antonio and surrounding areas. Background: Lauren is a 2008 graduate from Winston Churchill High School where she played setter on varsity for two years. 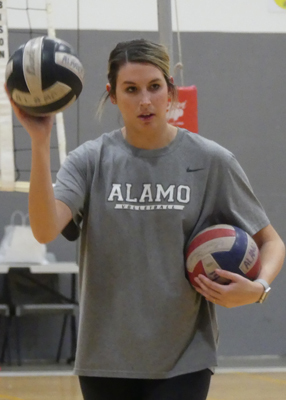 She played club volleyball for five years, four of which were for Alamo Volleyball. While playing with Alamo, Lauren attended the USAV Junior Olympics twice. After high school, Lauren attended The University of Texas at Austin. She graduated in May 2012 with her Bachelor of Business Administration degree in Marketing and a minor in Supply Chain Management. Lauren is now a Business Development Manager at RR Donnelley's DLS Worldwide. Background: Loren is a former Alamo player during high school where she went on to compete at the collegiate level for the University of Mary Hardin Baylor. She is now working on her BA in political science from Texas State University. This is her first year coaching junior volleyball for Alamo, but she is very excited to see where coaching takes her in the future. Background: Coach Vivens played volleyball, basketball, and ran track at Charles City High School in Charles City, Iowa, where she was a 3 year All-State Volleyball player, 4 year All-State basketball player, and went to State in track for the high jump and 4 x 800m relay. Kellee was recruited to play division 1 volleyball & basketball, but chose to attend Southwest State University of MN (NCAA II) where they allowed her to play both sports. As a middle blocker, her team made it to the 1994-1995 national volleyball NCAA II tournament in California. She has coached volleyball, basketball, track & soccer since 1997, and club volleyball since 1993, was the Girls Athletic Coordinator for NISD’s Jordan M.S. Since 2001, and currently has the same position with Dolph Briscoe M.S., where she continues to coach 7th/8th grade volleyball, basketball and track. Background: Tatiana graduated and played volleyball at Tom C. Clark High School, where she earned All City and All District awards and was a member of the Texas State All-Star Volleyball Team. She played volleyball for Alamo from 1995-1998. Tatiana continued her education at Baylor University where she received a Bachelor of Science degree in Education. While at Baylor she earned numerous awards including: NCAA Division I National Player of the Week, NCAA Division I Triple Double Club, Three All Tournament Awards, and is a member of the Baylor 25th Anniversary Team. Currently, Tatiana teaches PE at Jefferson MS and coaches volleyball, basketball and track. Background: Jean has 32 years of high school and middle school coaching and currently works at Tejeda Middle School. Jean is married with two adult children and loves to be with family and travel. 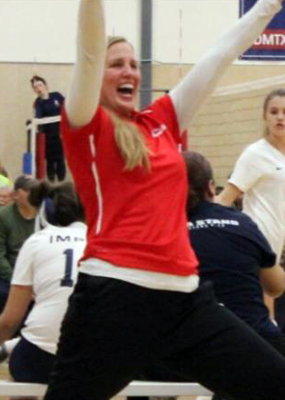 Jean really enjoys the opportunity to coach volleyball. Background: Born and raised in Harlingen, Tx. She was a 4 sport athlete for Harlingen South High School. She was a setter and right side for South and was a 3 time All-District Most Outstanding Setter of the year and 3-time All-Valley first team selection. She was also a 3 time All- District and All-Valley selection in basketball as well, and a 4 time regional qualifier in Track and field in the long jump, triple jump, high jump, and relays. She was also an All-District selection in golf. She chose to continue her basketball career at Texas A&M International University in Laredo, Tx. Gloria graduated with her Bachelor's of Science in Fitness and Sports with a minor in Mathematics in 2006. She received her Master's in Educational Administration from TAMIU in 2014. She has been coaching High School Volleyball since 2006. Before moving to San Antonio in 2014 she was Head Volleyball and Head Basketball Coach at United South High School in Laredo, Tx. She is currently an Assistant Volleyball Coach for Mike Carter at Reagan High School. She coaches JV Volleyball and Freshmen Basketball and teaches Math at Reagan. Her most memorable coaching moment is being a part of Reagan's incredible run to the UIL State Volleyball Tournament. She has a daughter Lauren who currently plays volleyball for Alamo. Background: Richard Simpson graduated from the USAF Academy and later earned his Masters of Public Administration from the University of Alaska. He served our nation for 23 years as a command pilot and retired from active duty in 2005 and continues serving as an AF Civil Servant. He has coached youth sports for over 2 decades and volleyball since 2001. Rich has served as a Club Founder, Director and Coaching Director of an area club. He is a USA Volleyball CAP II, CAP I and IMPACT certified coach and a regional referee. His teams have enjoyed great success winning major tournaments and qualifying for nationals. He has coached two high school all-American athletes and many others have gone on to play collegiate volleyball. He is passionate about the sport but most importantly, as a father of 3 multi-sport daughters and a long-time youth volunteer, he is dedicated to mentoring young people and helping them reach their potential as individuals both in and out of the sport of volleyball. Background: Shana Simpson graduated from Texas Tech with a BA and later an MBA. She has coached youth sports since 2000 and been an assistant volleyball coach since 2012. She is an IMPACT certified coach and a certified referee. Shana played H.S. basketball and ran track and cross country. As a mother of 3 grown daughters who were multi-sport athletes, she values the important lessons individuals learn while participating in sports. Shana has been a long-time youth volunteer, educator, team mom, and mentor and is dedicated towards seeing young people excel in volleyball and in their lives. Background: Graduated from South West Texas State University with a B.A. in Education and earned his Masters Degree from Texas A&M Kingsville. 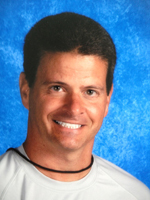 He started coaching in 1990 and served as Head Volleyball Coach at Randolph (90'-95') and Holmes High Schools (95'-99'), and is currently the Head Volleyball Coach at Reagan High School (99'-present). Coach Carter has over 800 high school victories,14 District Championships, 9 Regional Final appearances, 3 UIL 5A/6A Regional titles, 3 appearances in the UIL 5A/6A State Tournament and 1 appearance in the State Finals, coached in 2 state all-star games, and was the recipient of the 2006 SA Express-News Coach of the Year. His team has won the Texas Championship Final and Total points, and he has qualified teams in the 12-18 year old division to the USA Junior Olympics in both club and open. In May of 2007 Coach Carter received the Meritorious Service Award from USA Volleyball.